A French President for Georgia? Part of the opposition to Salome Zourabichvili stems from the widely held belief that a Georgian president should speak flawless Georgian. Georgia could get its first female president very soon if the establishment-backed candidate Salome Zourabichvili can watch her tongue.Backing from the ruling Georgian Dream party makes former French diplomat Salome Zourabichvili a strong contender for the presidency, up for grabs in a October 28 vote, but her candidacy is hotly debated, quite literally. Opponents have taken to filming themselves suffering as they eat chili peppers and denounce the presidential hopeful. Part of the opposition stems from a belief that a Georgian president should speak flawless Georgian, which is not Zourabichvili’s forte. Zourabichvili was born and grew up in Paris, in a family of Georgian émigrés, and has a tendency to drop bloopers. Par exemple, she said on the campaign trail last month that Georgia’s beauty allows one to “shove things in anywhere you want,” adding that this is something foreigners appreciate about the country. She meant to say that Georgia is a great place for archaeological digs and that Georgia should capitalize on its ancient past to attract culture vultures from around the world. Such comments inspire much comedy, but some Georgians are not entertained. “The president of Georgia should be able to speak Georgian, full stop!” said public persona Tako Charkviani last week. Zourabichvili brushes aside the grammarians. “I come with my Georgian Language, which many find wanting, but that does not matter,” she said on September 12, while trying to shift the focus to her platform – a broad promise of democracy and European ideals. She pointed out that she did not study in Georgia. Instead, she attended Sciences Po in Paris and Columbia University in New York – and thus her Georgian is not always up to snuff. Zourabichvili also worked for the French foreign service for the better part of her career until briefly becoming Georgia’s first female foreign minister in 2004 under President Mikheil Saakashvili. Fired a year later, she emerged as a vocal critic of Saakashvili and eventually aligned herself with the anti-Saakashvili Georgian Dream, now the governing force in Georgia. Some Georgians may excuse her French, but Zourabichvili is also often castigated for seeming out of touch. “This woman is a hellish cocktail of Georgian provincialism and French arrogance,” said fellow presidential hopeful Grigol Vashadze last week. Modesty does not always come naturally to Zourabichvili, a descendant of Georgian aristocrats. “The presidency is cut out of me,” she said during her failed presidential bid in 2013. But it was her remarks last month about who started the 2008 Georgian-Russian war that have really touched a nerve. Much ink has been spilled about who started the so-called Five-Day War with Russia in August 2008. 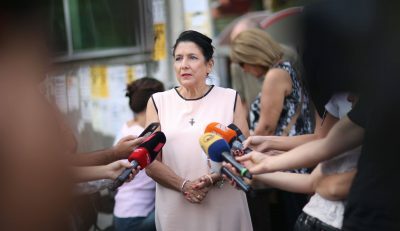 During the 10th anniversary of the war last month, Zourabichvili made the faux pas of blaming Georgia for firing the first shot, though she added that Georgia was provoked by Russia. Zourabichvili does have anti-Russia credentials: As foreign minister, she negotiated the Russian military’s withdrawal and was hailed as a hero in Georgia, including from some of her current critics. But memories are short. To rally resistance, the director of the influential, pro-opposition television channel Rustavi2 came up with the chili pepper challenge. “Take videos of how you eat chili peppers and denounce Salome [Zourabichvili],” said Nika Gvaramia during a show he co-hosts, as he took a bite of a red pepper. “Our fate, our country’s fate will be just as bitter – there is a total catastrophe happening in my mouth right now – if we elect Salome Zourabichvili,” a visibly reddening Gvaramia said. A few Georgians have taken the challenge, denouncing Zourabichvili in tearful video selfies. Another criticism is Zourabichvili’s coziness with the ruling party’s powerful billionaire chairman, Bidzina Ivanishvili. Ivanishvili-skeptics doubt her independence. But the association with Ivanishvili is also a strength. The election is largely seen as a vote of confidence in Ivanishvili and his Georgian Dream party’s rule, and his supporters are expected to vote for his candidate. In a poll published August 1, before Zourabichvili’s nomination, a hypothetical Georgian Dream-backed presidential candidate received the most votes. Ivanishvili and Georgian Dream, in the meantime, continue to insist that despite their endorsement, Zourabichvili is an independent candidate.